VJT takes pride in its ability to design customized solutions to provide products that are fully configurable to keep pace with your specific needs and requirements. This flexibility allows you to achieve custom capabilities and unique solutions for complex parts requiring obtuse and difficult angles on large parts. VJT’s fully customizable solutions are designed for your specific needs and requirements and help deliver confidence to achieve perfect results. VJT provides easy solutions that address complex parts requiring obtuse and difficult angles. One of the world’s leading automotive manufacturers turned to VJT to develop an efficient way to inspect their High-Pressure Die Castings. Our engineers worked closely with the client to create a unique and customized inspection solution that uses smart technology and robotics for a semi or fully autonomous inspection solution. The Robotic Engine Block System allows for completely automated inspection for an automotive lightweight solutions leader. Designed to inspect 3 different engine block types, this system can achieve 7 axis of rotation with its unique robot gripper that rotates within itself for added image flexibility. Achieve complete turn-key installation of a production with the Rocket Motor Inspection System. Radiograph two different similar sized rocket motors that meet the required inspection criteria. Perform a complete inspection cycle at the rate of 13 minutes per motor in the DR mode. VJT was able to create a custom solution for one of the world’s largest and premier automotive component manufacturers. 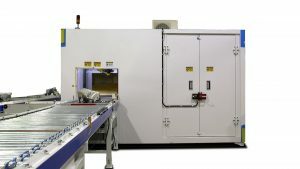 This product consists of a real-time pass through conveyor system with a C-Arm X-ray source and detector manipulator for high throughput inspection of engine heads, which is optimal for detecting castings defects. And, the system’s “Teach-and-Learn” based capability ensures mistake-free repeatable imaging. VJT’s custom solution is currently installed at multiple locations of this global automotive component manufacturing company. VJT has developed a custom solution for one of the world’s largest and premiere automotive component manufacturers. 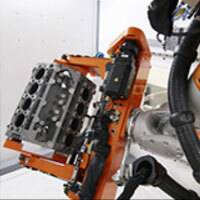 Ability to achieve real -time pass through with the system for high throughput inspection of engine heads. Ensure mistake-free repeatable imaging with the systems “Teach-and-Learn”. Customized C-Arm manipulator with exchangeable mountings for x-ray sources ranging from 160kV – 7.5 MeV.